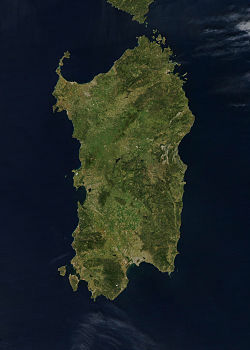 Satellite view of the Italian island Sardinia. Borrowing from Latin Sardinia, from Ancient Greek Σαρδώ (Sardṓ), from its name in a pre-Roman substrate language, *sard, *shard. It is connected by some scholars to the name of the Sherden or Shardana Sea People. A Phoenician inscription found in Nora and dated to the 9th century BCE identifies the island as shardan. An island and region of Italy. An unincorporated town in Indiana. ^ The Cambridge Ancient History →ISBN, page 369: "In the earliest Phoenician inscription found in Sardinia, that from Nora, probably of the ninth century B.C., although it is incomplete, the name of the island appears as Shardan (be-shardan), [...]"
From Ancient Greek Σαρδώ (Sardṓ).